And then the sky opened and Jimi Hendrix entered into our lives. 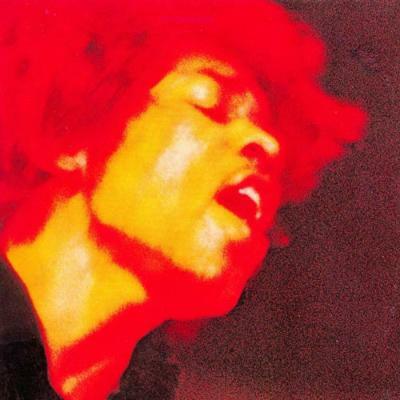 Are You Experienced, Axis: Bold As Love, Electric Ladyland… We all moved to another dimension with him, it was a revelation, a touch of higher force. And he was not white, like John, Paul, George and Ringo or the Stones were, he was black and he was a Gypsy and his music and his image were so absolutely superior to everything we ever heard before. We kids believed that Hendrix was some kind of 'higher conception of the universe', especially when we heard the elder boys talking about him with a total and almost fearful respect. For some reason it was impossible to buy his early albums in Yugoslavia, except some strange unofficial bootleg and later, in 1971, The Cry Of Love, as well as Band Of Gypsys too. But we had our ways to order records outside the country. It wasn't that simple, we had to save some money, actually get it from our parents and grandmas, find the right channels, asking elder boys for help, and than we had to wait for a month or more for the package to arrive. If it arrived. Although Yugoslavia was fairly open, sometimes packages were "lost", or kept by the customs police if they didn't like the content. But I finally received my Electric Ladyland double album, and it was the original one, with the notorious gatefold sleeve packed with naked females, which could have easily been confiscated by customs for being pornographic. I was around ten years old when I received this album and for me this day was the beginning of the rest of my life. I locked myself in my room, listening to this album as carefully as possible from song one, over and over again, for the whole day. To me, this was a bible and a manifesto. In the end I opened the window on the fourth floor of the socialist housing block, put my gramophone speakers on the window and played Hendrix as loud as possible to the rest of the world out there. The police arrived and I had to stop, but this wouldn't be the last time that I was generous, sharing my music conviction and taste with the rest of the working class world around. When Hendrix died (we heard the news on Radio Luxemburg sometime in the evening), life stopped for us, the music lovers. But strangely, not only for us: the next day, students burnt candles in secondary schools and gymnasiums to commemorate his death and there was a proper student procession of mourning through the main street of Trbovlje. I was proud then to be born in this city. I cannot imagine that something like that would happen today, even if Justin Bieber suddenly died.